The April school holidays are just around the corner, and that means Easter. It's a time of tradition, religion and reflection, as well as family and fun. For most kids, however, it's all about the chocolate eggs and the Easter Bunny, and taking part in some awesome Easter egg hunts happening around Perth. 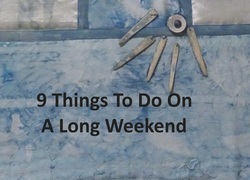 Here's where you'll find them, plus a few other local activities happening over the long weekend. Don’t forget that if you know of a great event, you can always leave a comment to let us know and we’ll add it to the article! Date: From Saturday, 8th April to Saturday, 22nd April. Entry cost: Free to enter. There will be lots of great prizes to be won, so be sure to grab a #Freo_easterhunt map and head to Fremantle from Saturday, 8 April to start hunting for some special eggs. Locate the shops with the Easter Bilby in their windows and head inside to find the number on their special Easter Egg. Collect all the numbers, crack the code and you can enter the prize draw. Date: Easter Sunday – 16th April from 8am to 11:30am. Address: Quarry Adventure Park, corner of Pebble Beach Rd and Wincrest Way, Meadow Springs. Entry cost: $5 – includes entry to the hunt, sausage sizzle and drink, raffle entry and lots more. Website: To buy tickets, click here. For more information, see the Facebook event. Join in Mandurah’s biggest Easter hunt and not only will you score some awesome chocolate goodies (courtesy of the kids and their excellent hunting skills), but you’ll also be supporting a great cause, the Make-A-Wish Foundation, which makes dreams come true for sick children. There will be three age categories for the hunt – up to five, six to nine years and 10 to 16 years, and a heap of activities taking place on the day. Image: REMAX Benchmark Real Estate Sales & Rentals Facebook page. Date: Easter Saturday – 15th April and Easter Sunday – 16th April. Address: 2149 Albany Highway, Gosnells. Website: For more information, read on here. The Gosnells Hotel will host an Easter Egg Hunt from 1pm on Easter Saturday and on Easter Sunday, there will be heaps of kids activities happening from 12pm. Date: Easter Sunday – 16th April 2017 from 11am to 4pm. Address: 164 Fletcher Road, Karnup. Entry cost: $40 per car or family of two adults and three kids. Entry costs will cover a heap of activities including a bouncy castle, magic show and face painting plus lawn games and lots of other fun things to do! There will be a range of food stalls, and the venue is fully licensed, so no BYO alcohol please. Image: Peel Manor House Facebook page. Date: Easter Monday, 17th April at 10am. Address: The Beach House Kids Fun Centre, 4-6 Halley Road, Balcatta. Entry costs: Included in entry price. Website: See the Facebook event. The Beach House Kids Fun Centre will host an Easter egg hunt from 10am to 11am on Easter Monday. Don’t worry if your child doesn’t find their fair share of chocolate – the Easter bunny will be in attendance, handing out lots more chocolate eggs. Date: Thursday, 13th April and Easter Saturday – 15th April from 10am to 1pm. Address: 200 Karrinyup Road, Karrinyup. Date: Monday, 10th April to Easter Sunday, 16th April from 10am to 3pm. Address: 36 Ocean Keys Boulevard, Clarkson. Website: See the https://www.facebook.com/events/687966751393592/ Facebook event. Help the Easter bunny find his eggs! The hunt is open to kids under 12, and there will be plenty of clues to help them along the way. All children who get all the clues correct will win a prize. See the information desk for more details and to enter. Date: Sunday, 9th April from 2pm to 5pm. Address: Cockman House, Ocean Reef Road, Wanneroo. Cockman House will host a free family Easter egg hunt on Sunday, 9th April. Date: Easter Sunday – 16th April and Easter Monday – 17th April from 10am. Address: 1635 Neaves Road, Bullsbrook. Entry cost: Included in standard entry price to the Maze. Website: To read more, click here. Along with the annual Easter egg hunt, the Maze will also be running a silent disco, just for the kids! There’ll also be lots of other fun activities and Whistler’s Chocolate giveaways happening on the day! Entry cost: Activities are free to take part in. Website: See the Facebook page for more information. The Easter Egg Trail Hunt will start at 2pm, but there will be plenty of activities happening throughout the day including an Easter colouring competition, playground and bouncy castle. This article will be updated as Perth Mums Group receives word of any other great Easter egg hunts happening around the city, so stayed tuned!